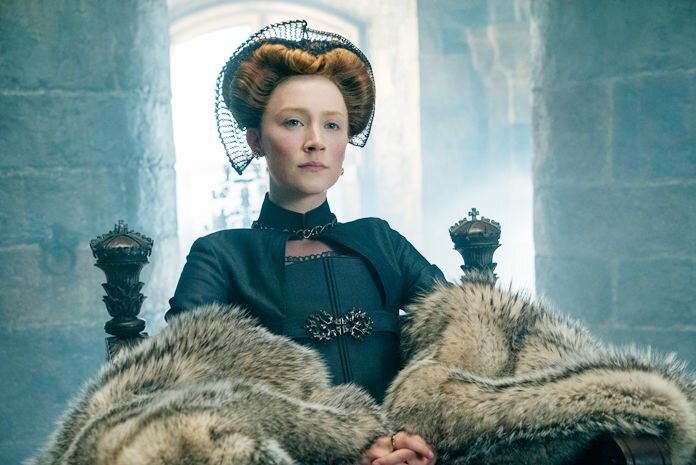 Los Angeles (AP) – “Mary, Queen of Scots “ is an ambitious re-imagining of the Mary Stuart and Elizabeth I saga with modern flourishes and bold performances from Saoirse Ronan and Margot Robbie. But the film, for all its prestige and edginess, its lofty goals and contemporary messages, is not a particularly engrossing experience. It’s a shame too, because most of the elements are there. The gorgeous costumes and meticulous settings are breathtaking, and they couldn’t have chosen two leads better suited to playing these women, with Ronan as Mary and Robbie as Elizabeth. They just don’t come together very well, straddling an awkward line between wanting to be both a modern referendum on the real struggles of being a female leader in the 16th century and a “Game of Thrones”-style actioner. Director Josie Rourke, who has a background in theater, certainly has a knack for grandeur and drama. But choppy editing and stilted story evolution never really do justice to what should be an epic and suspenseful tale of political machinations and power struggles. But the question of a successor remains and becomes urgent when Mary comes back on the scene and starts making her own claims to the throne. The two rulers correspond and negotiate in an elaborate game of chess in which everyone is attempting to manipulate an unstable situation. Elizabeth tries to offer up a husband to Mary, in her own lover Robert Dudley (Joe Alwyn), as a strategic plant. But, Mary, seeing through the plan, weds another Englishman, the charismatic Lord Darnley (Jack Lowden), ensuring that her offspring would have a legitimate claim to the throne. There are interesting ideas to explore about being a powerful woman in this time. But the script from “House of Cards” creator Beau Willimon seems to oversimplify things. He imagines a relationship that devolves mostly because of Elizabeth’s jealousy of Mary’s youth, beauty and ability to bear children. This point is hammered over and over, as Elizabeth, hearing that Mary is pregnant, gathers her skirt to just see what she would look like pregnant in silhouette. The birth scene is even more noxious, cutting back and forth from Mary in labor, to poor, sad Elizabeth creating the only thing she can — paper flowers. The film takes enormous liberties with history, bringing the two rulers together for a face-to-face conversation, and infusing the cast with more diverse faces and themes to varying degrees of success. That conversation that apparently never happened is well worth the factual leniency. It’s the scene that the whole film is building toward and both Robbie and Ronan are extremely compelling — vulnerable and introspective yet also fierce and unwavering — in this power showdown. Unfortunately the journey to get to this part is long and, for long stretches, quite dreary and dull. “Mary, Queen of Scots” also has the misfortune of coming out around the same time as the deliciously compelling and lively Queen Anne film “The Favourite” and might get lost in the shuffle. This is a more staid and straightforward experience, and, for some costume drama enthusiasts, possibly even the preferable one. But for this critic, “Mary, Queen of Scots” was royally underwhelming. “Mary, Queen of Scots,” a Focus Features release, is rated R by the Motion Picture Association of America for “for some violence and sexuality.” Running time: 112 minutes. Two and a half stars out of four.